Ginebra booked a slot in the 2015 PBA Commissioner’s Cup quarterfinals after beating GlobalPort in Lucena City. Veteran Mark Caguioa stepped up for the Kings, who are now at 5-5 in the standings. Japeth Aguilar helped Ginebra get past GlobalPort last night! The Barangay Ginebra San Miguel Kings picked up a key victory in its quest to hang onto one of the top eight places in the PBA Commissioner’s Cup standings as it routed GlobalPort, 96-81, on Saturday at the Quezon Convention Center in Lucena City. Michael Dunigan and Greg Slaughter both scored 22 points to lead the Kings in the 15-point rout. Dunigan also had 18 rebounds and 5 blocks. Josh Urbiztondo added 11 off the bench. 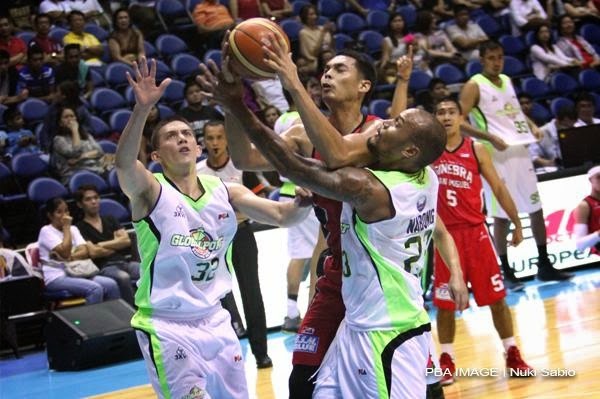 Ginebra entered the game tied with GlobalPort and Alaska for the sixth to eighth place with identical 4-5 marks. Breathing down their necks were Barako Bull and Kia at 4-6. With the win, the Kings moved up to solo sixth at 5-5, while the Batang Pier are now tied with the Energy and Carnival. Barangay Ginebra utterly dominated GlobalPort in the first half. Longtime star Mark Caguioa fired the opening salvo for the Kings, scoring 11 points in the first quarter, just one shy of the entire Batang Pier team combined. Terrence Romeo led GlobalPort with 20 points but many of those came in the fourth, where they already trailed by a sizeable margin. He and import Derrick Caracter combined for just five points in the first half before bouncing back for more respectable numbers by the end. Line of the Game: Mike Dunigan (GIN) - 22pts, 18rebs, 5blks, 2stls, 1ast, 50.0% FG shooting.